1943. The illustrator wants to make sure you understand the function of this garment; one wears this coverall with sensible (but very cute) little flat shoes in the kitchen, where the carpet sweeper awaits you once you doff your bright red rubber gloves. This war-time dress, cut from about four yards of 36" wide fabric is wrap-fronted but not reversible fronted like the earlier Hoover aprons. The instruction sheet still gives directions for making hand-worked button holes, and also expects that you'll baste the sleeves in by hand before sewing them on the machine. you really can tell from the cut of this that it's a war-time dress, can't you? i am just beginning to be able to decipher all of the ins and outs of such things, but it is all so very interesting! The gathered front of the top wrap portion of the skirt is a very practical design detail; it gives the wearer the necessary coverage when she sits down. I recently purchased a mid-1950's day dress pattern (a plain button-front, a little less informal than the wrapper styles) that had originally been mailed to somewhere in Ohio. There was a handwritten notation on the front of the mailing envelope: "Takes three feed sacks to make this dress, of same material." I really like the narrower cut of the 1940's dresses better than the square-miles-of-skirt you get in the 1950's. The pattern above has a bell-shaped six-gored skirt that appears to be a holdover from the late 1940's. 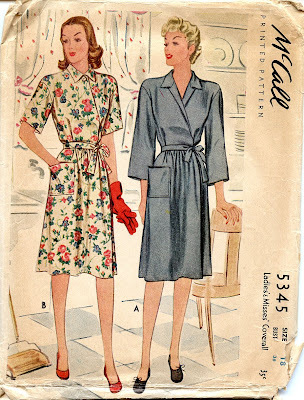 I've got a serious weakness for 1940's housedresses in general, though; so many of them had such practical pockets and yet were designed to be cute and creative. There is something very no-nonsense and thrifty about war era clothes, and of course, the New Look was reaction to this. I agree that adequate pockets is a big plus with house dresses. Every once in a while I'll make a skirt or a dress without pockets and it's always a huge mistake; I think the days of tucking one's hankies in one's bosom are definitely behind us.